Suzuki Intruder M 1800RZ caught the eyes of many people in the Delhi auto expo 2012. A huge cruise built with a high capacity engine was one of the longest feathers in the Suzuki's crown in a 2012 exhibition. Chrome plated dual silencer and engine assembly, engine fit compactly yet perfectly in the body, streamlined head lamp cover, broad wheels fit with radial tire on the rear and an LED tail lamp make the intruder an incomparable cruise to Indian roads. Suzuki Intruder M1800RZ a limited edition bike in Indian market is also known across the globe for the large diameter of its engine bore which is an indication to its power output capability. 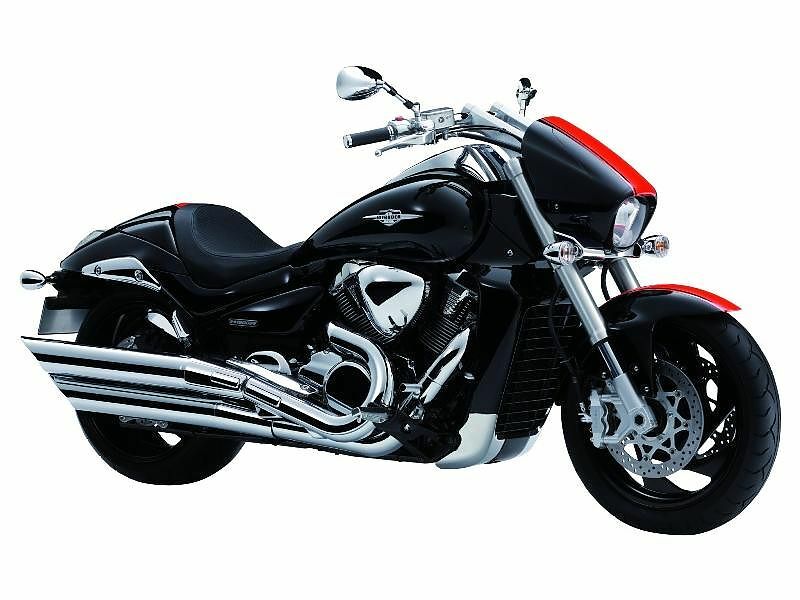 Suzuki Intruder M 1800RZ is powered by a 1783 cc V engine where the twin cylinders are inclined at an angle of 54 degree. The four stroke engine is liquid cooled and uses two camshafts to actuate its inlet and exhaust valves. The engine uses a technology where the torque starts to increase right from the start of the engine and it hits a high of 160 Nm by just 3200 rpm. The engine is designed to produce a maximum power of 127 bhp which is attained at 6200 rpm. 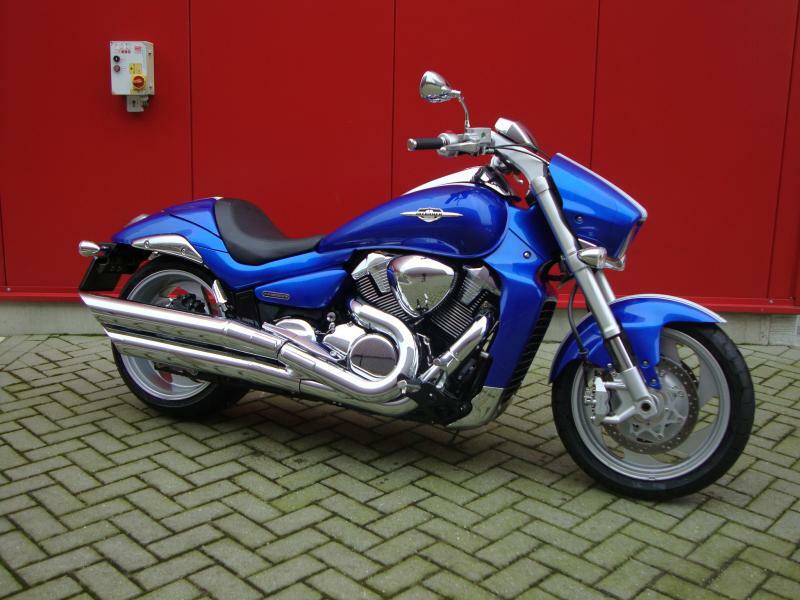 Suzuki Intruder M 1800RZ is horizontally long with a wheel base of 1710 mm. Being a cruiser the foot rest of the rider is offset towards the front from the riders seat and the handle inclined towards the front is slightly higher than the seat height (705 mm). From all these features of a cruiser a rider can sit straight on a comfortable seat with not much effort on the arms. Suzuki Intruder M 1800RZ is run by wide radial tires with the rear tire being about 9.4 inches wide in its unfilled state. The higher load index on front and rear tires make the bike capable of carrying higher weights and the tires are capable of sustaining speeds as high 240 kms/hr. The larger wheel base gives better stability to the bike in its top speeds and quick accelerations. The front tire of the bike is loaded with two discs and the rear with single disc which mounted with piston caliper assemblies for quick and effective braking of the Intruder. The oil damped telescopic coil springs on the front and the link type coil springs on the rear of the bike ensure better handling and control of this high power machine even in uneven roads. The 1800 cc bike can give a mileage of about 14 to 20 kms per liter of fuel. This mileage will definitely depend on riding conditions and road conditions in India. 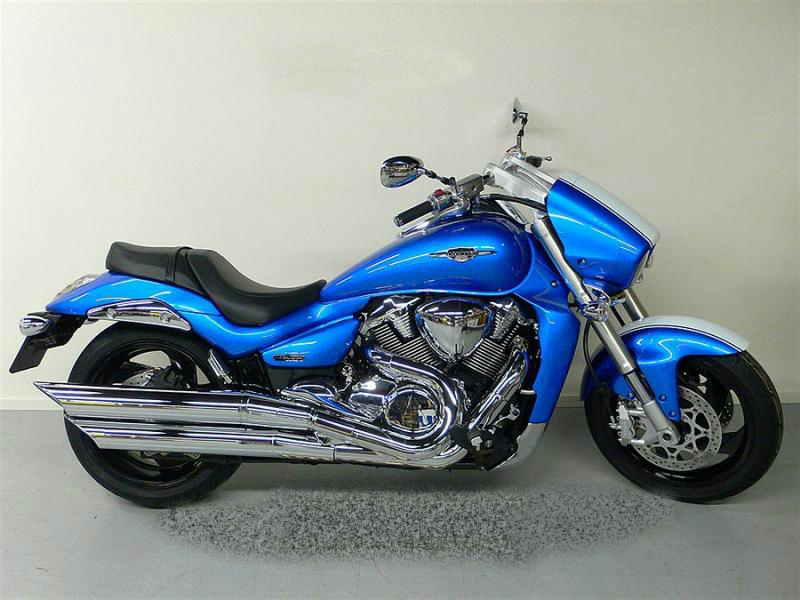 Suzuki Intruder M1800RZ is available in blue color in Indian market.